Unfortunately, inefficiencies are hard-wired into this process, so there has always been a desire for improvement. For example, there are uncontrollable environmental factors at play -- such as the weather and track conditions -- and there are always delays incurred due to changing vehicle parts and/or tuning them to induce different vehicle behaviors. Since the 1960s, computer simulation has held the promise of creating ‘virtual proving grounds’ where such inefficiencies no longer exist. And in today’s vehicle development landscape, computer simulation plays a major role in an objective sense, allowing vehicle performance mapping via sophisticated vehicle models and scenario simulations. In addition, Driver-in-the-Loop (DIL) simulation is now capable of connecting expert test drivers to these sophisticated vehicle and environment models in order to bring the all-important subjective assessment layer into focus. If an appropriate engineering-class DIL simulator is in place, it is indeed possible to conduct virtual test drives, covering all the primary dynamics that might be required to develop a modern vehicle. In fact, at present, DIL simulation fidelity limitations exist only in the vehicle and environment modelling, not in the machinery, graphics, etc. associated with the currently available low latency, engineering-class DIL simulator technologies. Engineers can employ fail-often-fail-well strategies, evaluate/accept/reject models for rapid pre-prototyping, and move confidently and cost-effectively to the next stages of development. With DIL simulation integrated into the vehicle development process, even extreme failure cases can be explored in a safe and controlled environment. New opportunities exist in the pursuit of relating subjective and objective assessments. This is primarily due to (i) the controlled laboratory environment of a DIL simulator session and the associated model parameters, (ii) the speed at which a test driver can be immersed in new scenarios, i.e. less time is allowed for external influences to introduce subjective bias, and (iii) the ability to conduct true double-blind experiments. 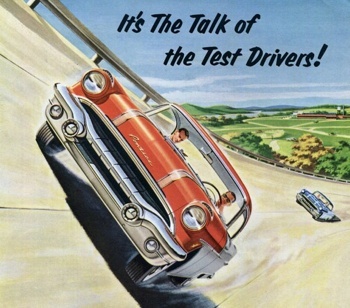 Virtual test drives are, of course, 'fully instrumented' from a vehicle perspective such that many difficult-to-instrument data channels (tire lateral slip angles, etc.) are readily available. But data acquisition can easily extend into the realm of driver measurements as well. Driver measurements have historically been associated with Human Factors DIL experiments, but new opportunities exist in areas such as the exploration of driver emotional responses to vehicle tuning changes, and driver interactions with on-board systems. To learn more about the advantages of low latency, engineering-class driving simulators, download our FREE white paper, “Look Down the Road: Driving Simulator Technology and How Automotive Manufacturers will Benefit”.